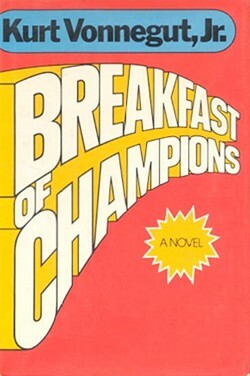 Breakfast of Champions, or Goodbye Blue Monday, published in 1973, is the seventh novel by the American author Kurt Vonnegut. Set predominantly in the fictional town of Midland City, Ohio, it is the story of "two lonesome, skinny, fairly old white men on a planet which was dying fast." One of these men, Dwayne Hoover, is a charming but deeply deranged Pontiac dealer, and extensive land and franchise owner, whose mental illness causes him to believe that a science fiction story by the other man, Kilgore Trout, is the literal truth. Trout, a largely unknown pulp science fiction writer who has appeared in several other Vonnegut novels, looks like a crazy old man but is in fact relatively sane. As the novel opens, Trout hitchhikes toward Midland City to appear at an art convention where he is destined to meet Dwayne Hoover and unwittingly inspire him to run amok.